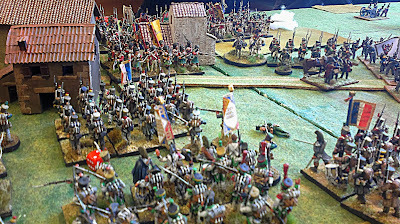 2) The interpenetrated troops from retreating units, as a result of a losing hand to hand combat, must make a morale check: if they fail they suffer 1 hit. 3) To interpenetrate a friendly unit movement costs half move. 4) You can fire only if the unit moves once. A thin line of Dutch troops under the command of General Perponcher tries to stop the French II Corps. Meanwhile in the Bossu forest the Prince of Orange harangues the 28th Nassau to hold the line. The French press on the Belgian-Dutch units. 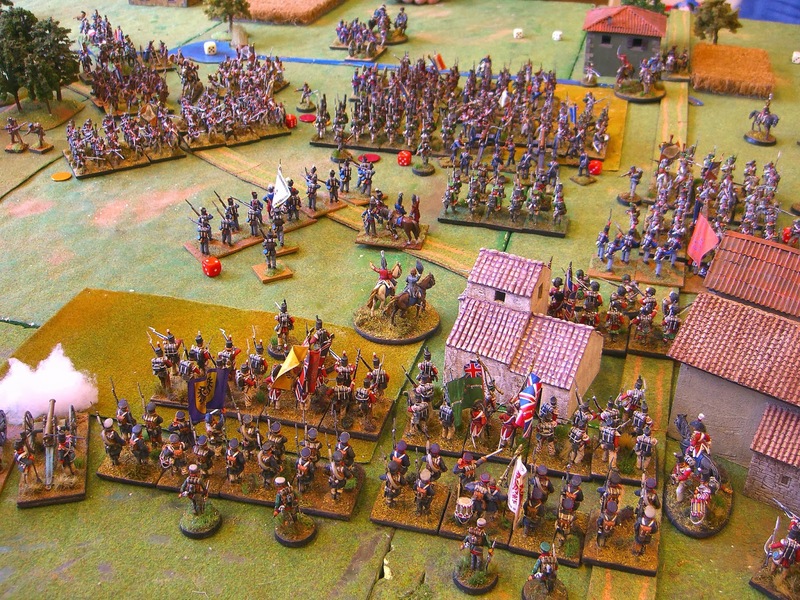 On the Allies left the 8th Belgian militia brigade stubbornly (and surprisingly ) resists against two French columns. Wellington reaches the battlefield. The battle continues: the French press the left Allies side. On the right the English guard regiments, under the command of Cook, enter slowly. The French II Corps continues its pressure. At the center Foy and his 9th Division are forced to fall back and the 2nd Division leads by Bachelu reaches the French main objective, Quatre-Bras crossroad, forcing the English to retreat. 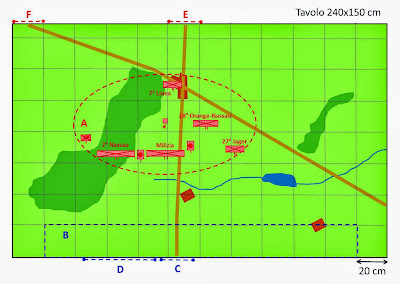 At the center the Hannoverian troops repulse back Bachelu infantry and regain the crossroad while on the French left Kellerman crash his cavalry regiments against the Guard squares. Finally Kellerman. On June 16, 1815 he'll receive from a frantic Nay the order to keep the pressure on Allies, leading his one available cuirassier brigade he tries to break Wellington's line. In the game Kellerman and D'Hurban try to outflank English forces but they are stopped by Guard's squares. 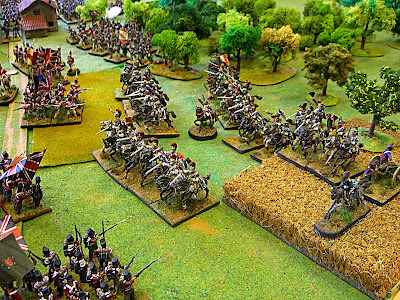 Scenario and miniatures are prepared by La Piccola Armata members. Ezio creates the scenario while miniatures are painted by Flavio, me and Alberto. 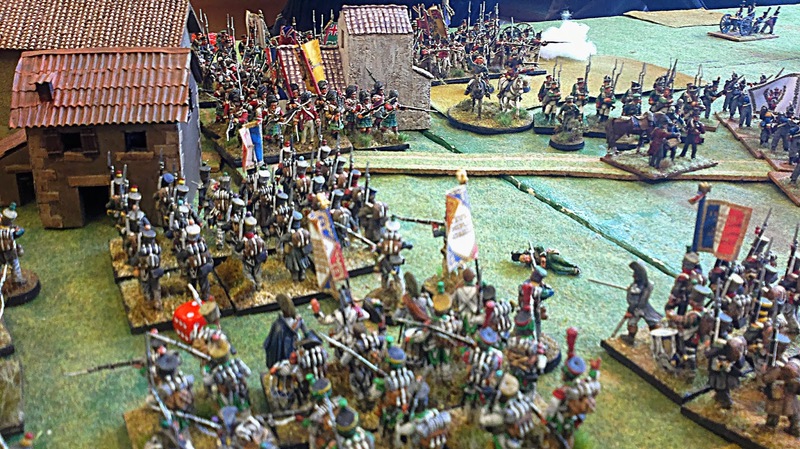 Complimenti ottimo blog e battle report noi stiamo iniziando a provare BP da poco. Purtroppo non sono ancora utente di Google+ ma vi seguirò lo stesso e vi inserirò tra i miei blog preferiti.